Make It Real Play. This is a DIY project. No need to swim underwater to create this mermaid magic. With pre-cut fabric, children will learn spatial skills as they construct the tail knot by knot. 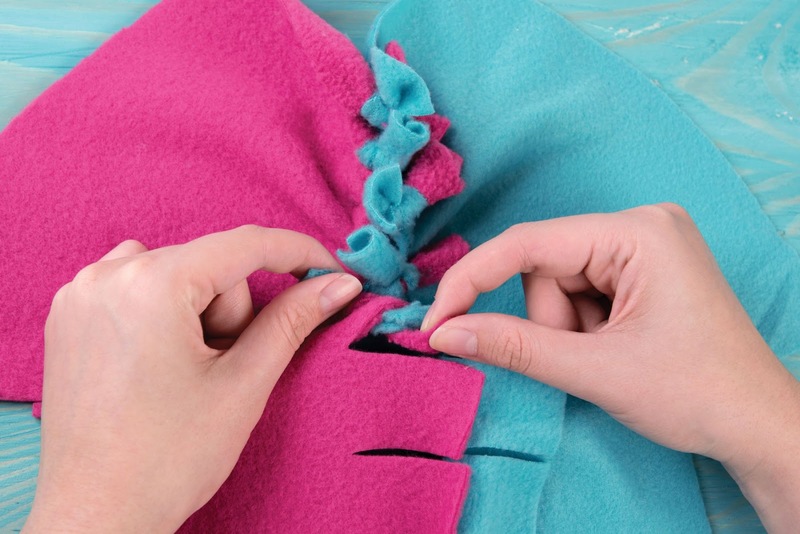 Plus, cozy fleece fabric means snuggles for days! The Knot and Bling Mermaid Tail Includes Pre-cut fleece, large sequins plus an exclusive Dream Guide. 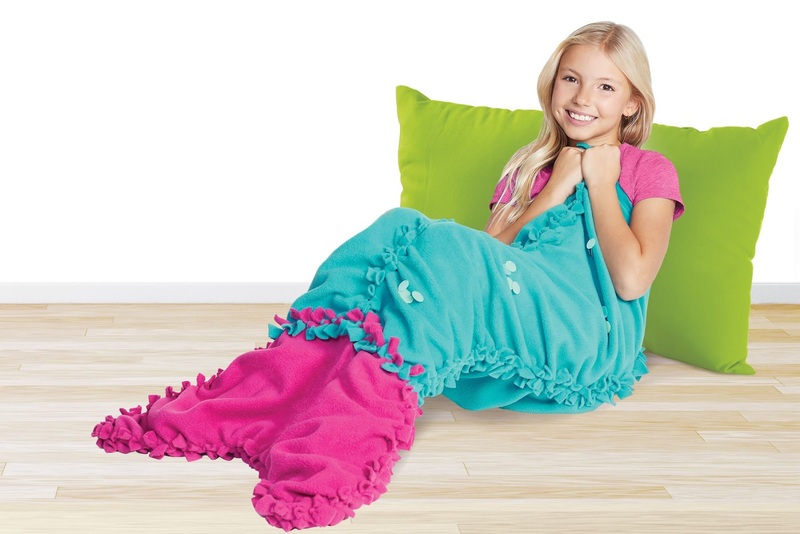 The Mermaid tail assist children with fine Motor skills and Hand Dexterity focus on the use and coordination of small muscles in the wrist, hand, and fingers to perform activities like writing, sketching, painting, and more. The Mermaid Tail also helps with Self Actualization is the process of using creativity, spontaneity, and independence to reach an individual’s full potential.The development of cognitive skills throughout a person’s life enables him or her to learn, understand, and assimilate information. Cognition includes the ability to pay attention, reason, find solutions to problems, make comparisons, analyze data, evaluate, and make comparisons. Also visual motor skills focus on hand- eye coordination and visual perception required for tasks such as cutting, sketching a two-dimensional image from a 3 D object, and the ability to recall an image seen previously. 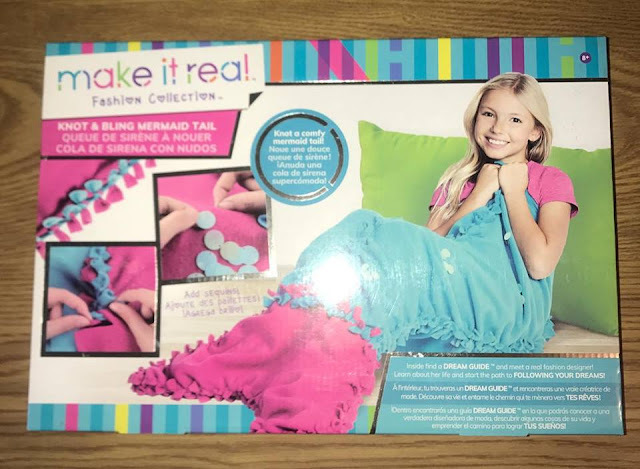 We have had lots of fun with the cool stuff we have received from Make It Real Play. The kids have had hours of play and creativitey!! This mermaid tail looks so adorable. I really like these idea of knot bling. Wow, this is nice. My daughter will surely love this one! I'm very impressed by your skill at making fun things. This mermaid tail is simply one of the best I've seen in ages. This is so cute and I love how you get to make it yourself! Such a great gift for any little girl! That looks like a lot of fun! I would like to try this myself. That is adorable!! I always see the ones that are crocheted, but hey, maybe I could actually make one like this! :) Great gift idea. Not only would this be fun to make--but it looks like it would be really cozy for those cold winter months to come! My daughter would love this! She has been wanting a mermaid tail for a long time! The fact that she gets to make it, makes it even better!